We bring tidings of great debt. The holidays involve presents, decorations and spending time with family. This often comes at the expense of one's bank account, so the last thing we need is a free-to-play iPhone and iPad game nickel and diming us every chance it gets. That said, Pocket Gems' Paradise Cove: Holiday Adventure exemplifies everything that's fun and frustrating about this time of year. On one hand, there's plenty of holiday cheer to go around. On the other, it wants money, and lots of it. Things start out simply enough. 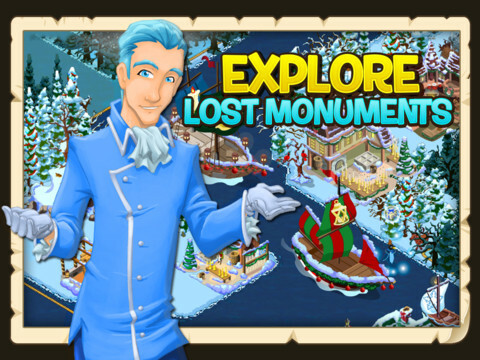 Presented with a rather large map, it's up to you to rebuild the North Pole and help those in need while at the same time adding a personal touch to the environments. Visit the Shop, and you'll find a host of holiday-themed items, including St. Nick's Home, Santa's Workshop, a Turkey Farm, Festive Fences, gifts and snowmen; you also have the option of sending ships on voyages to collect resources. This all ties into a wealth of missions that result in modest rewards upon completion. To that end, Paradise Cove plays almost exactly like the countless world builders that have come before it. If you've checked out even one of those titles, everything will seem familiar. The developers just added a Christmas-theme, and taking that into consideration, the team did a good job. Not only were the graphics designed to put gamers in the holiday spirit, but also the music, which would fit right at home inside a department store. That's fine, but you literally cannot progress without a.) putting the game down, sometimes for hours until you earn enough virtual currency, or b.) making an in-app purchase. Granted most freemium games work this way, but Paradise Cove takes the concept to extremes. Initially, it presents you with a small plot of land the size of a postage stamp compared to the rest of the world, and it doesn't take long before you've depleted the modest amount of coins and Holly Berries the game provides. Buying more is easy enough, but therein lay another problem. Spending $0.99 results in just 30 coins, a pathetic sum that'll barely afford a Candlestick Maker (24 coins) and woefully short of the Sailor's Inn (96 coins). To start making a dent, you'll need to spend $4.99 at the minimum for 180 coins or 60 Holly Berries, and even then, that'll run out quickly. Earning money is much easier once you plant a few businesses, but the initial slog may turn people off. It's a shame, because aside from Pocket Gems' money grubbing, Paradise Cove: Holiday Adventure is decent enough. Not only does it put us in the spirit of the season, but it also follows the basic foundation of the best world builders on the App Store. Ultimately, it comes down to your thoughts on in-app purchases. 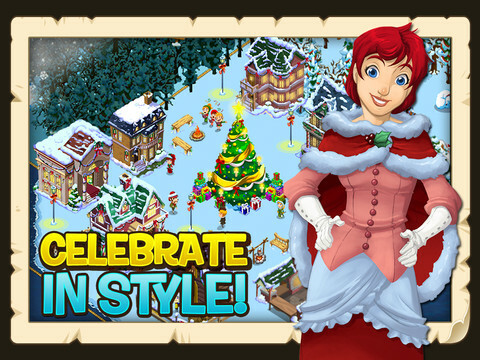 If you're OK with spending cash to get things going, there's a lot to like about Holiday Adventure. Conversely, if you detest digging into your pockets, you'll find more generous games on the App Store. What's Hot: Holiday cheer to spare, a variety of seasonal decorations, appropriate music, huge world to explore. What's Not: Takes in-app purchasing to extremes, does little we haven't seen before.